Shelbourne Street Green Space is in the city of Victoria, B.C., one of thirteen communities that form the Capital Regional District of British Columbia. 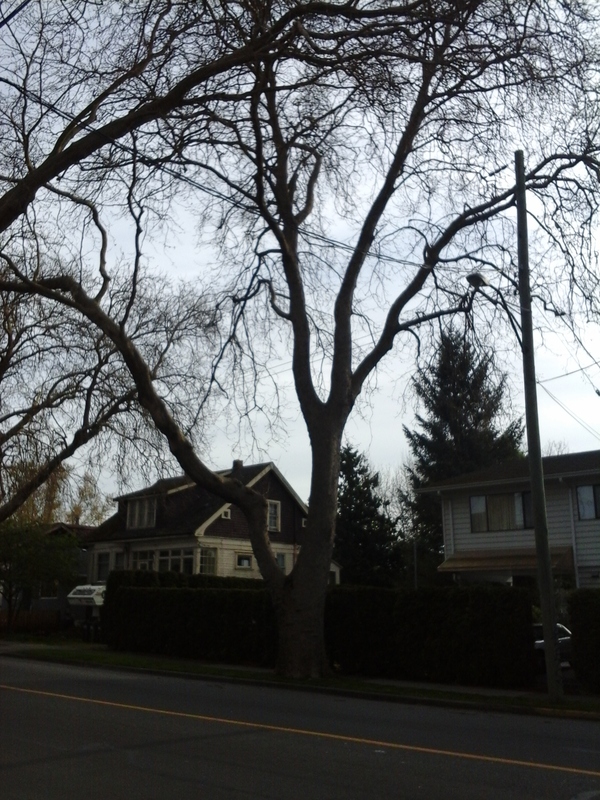 Planted as a memorial to British Columbia war veterans in 1921 along Shelbourne Street are many large deciduous trees. At that time Shelbourne Street was a major road leading of Victoria with the proposed name of Memorial Avenue. Stroll the twelve hundred meters, along the sidewalk, between Bay Street to Hillside Avenue within the City of Victoria to enjoy these lovely London Plane and American mountain ash trees. The trees provide unique silhouettes in the winter and ample shade during the summer. Both the ash and plane trees have straight trunk covered with a camouflage pattern bark. There are also some lovely houses and gardens to enjoy along the way. Oaklands Park and David Spencer parks are a short walk along Ryan Street from Shelbourne Avenue. Shelbourne Street Green Space can be reached from the Trans Canada Highway. Follow the roadway as it become Douglas Street and reached Hillside Avenue. Turn east onto Hillside Avenue and continue to Shelbourne Street. Turn south or right onto Shelbourne Street and look for roadside parking. There is limited roadside parking in this Oaklands neighborhood as most is posted as residential. Buses travel along Hillside Avenue and Shelbourne Street from downtown to the University of Victoria and Gordon Head neighborhood of Saanich.